Pictured, from left to right: _______, Nicole Dowdy, Dustin Dowdy, Jeff the friend. Dustin Dowdy is trying to track down the man that helped keep him from missing the experience of a lifetime. Dowdy, a lifelong Auburn fan, and his wife Nicole, a recent Auburn convert, were in University of Phoenix stadium to watch the Tigers play for the national championship last week. They’d crossed the country, paid the money, dreamed the dreams. Then, disaster. 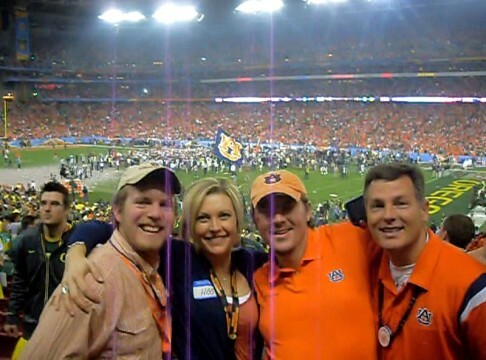 When Dowdy went to high five a fellow Auburn fan during the first quarter, he slipped on the seat front of him (which was slick with spilled beer), fell forward, face planted onto the stadium steps, and was knocked unconscious. 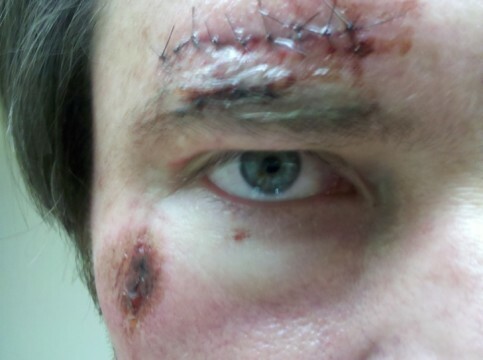 Nine stitches. Never to yield. And then he was taken to the emergency room. Determined to get her husband back to the game, Nicole begged the doctors to speed through a CT scan and the stitches he needed over his right eye. Somehow, the couple made it in and out of the hospital in just one hour. Dowdy still can’t believe it — not just the timing, but Nicole’s dedication. But whether they would get back inside the stadium was someone else’s: official policy said no re-admittance. After a thorough explanation and hefty does of passionate pleading, they were back in Sec. 103 with 12 minutes to go in the game. Dowdy was able to see Auburn’s final drive —at least through his one good eye. He saw Byrum’s kick, he saw the confetti fly. And when he and Nicole posed for a photo with the field in the background, they spotted the stranger who had helped carry him up the stadium stairs. “Hold on, we’ve got to have this man,” Dowdy’s friend can be heard saying in the video accidentally recorded by the Oregon fans gracious enough to take – or at least attempt to take – a photo of the group with the Dowdy’s cell phone. He points to someone off camera. “Yes, we do,” Nicole says. They got the man to come down for the picture. They just never got his name. Here’s hoping it’s another post-season match up you rush back from the hospital for. Sounds like a Facebook tag-fest to me. No, it wasn’t. It happened just like its written. I would like to thank someone crucial to making sure I didn’t miss one of the most important moments in my life. No, Dustin, I meant to suggest that maybe the picture goes up on Facebook and you let the power of the people, via tagging the good stranger, help with the identification. More importantly, I hope you’re feeling better. Nasty spill. His name is Chandler Minton. He was my fraternity brother at Auburn (he has since graduated) and is a great guy. Hope this helps. That’s me! Wow, this is crazy! My buddy just showed me this message. I live in jackson hole wyoming but im hoping to be down in auburn for the homecoming and uga game this fall. If you’re by chance around, I’d love to buy ya a beer and share the memory. Either way, thanks for the honorable mention but, as you know, we’re family. Taking care of one another is what we do. War Damn National Champions! Excellent! Chandler Minton is a true Auburn Man. And for a “recent convert,” Nicole is pretty fearless and true herself. Best wishes to all of you! You can never buy me a beer. I owe you several cases. Please email me at [email protected]. I have tickets for you for both of those games. Thanks again for helping this bumbling idiot not miss one of the best moments of my life. Thats our Chandler!!! He never mentioned it to us. He is one of the most helpful stepsons I have. Always so polite & helpful. I t’s just in his nature. Glad he was there for you. Also a handsome one!